"As a regular visitor I first discovered Teak Tree Lake when it was in its infancy about 4 years ago. It has since developed into a very secluded piece of paradise just a short drive outside of Chiang Mai. The venue is also a great focal point for those wishing to visit other local attractions such as the tiger and elephant parks. You are collected from the airport for the drive to your own luxury bungalow within the grounds of this private walled fishery. The lakeside bungalows are fantastic with en-suite facilities and air-conditioning plus your own fishing platform immediately in front. The hospitality from the Teak Tree Lake fishery team are second to none. If you need help with fishing then Teak Tree Lakes experienced guides with many years experience behind him and if you decide on the full package then Noon's culinary skills are superb. My last trip was in May when I notched up my 18th species from the lake. You can target individual species such as the numerous carp or go for the massive predators that are in here but sometimes it's fun just to see what comes along. The growth rate of these fish is incredible. Anyone who likes fishing abroad or wants to target new species will love this place. I'll be back in November." As a lover both of the Thai lifestyle and Thailand’s enormous freshwater species, I made the acquaintance with Teak Tree Lake some three years back. I have become, and will remain, a regular visitor.The high points for me are the superb advice from the fishery owners, with the intimate knowledge of a lake that only a real fishery manager and angler can deliver. 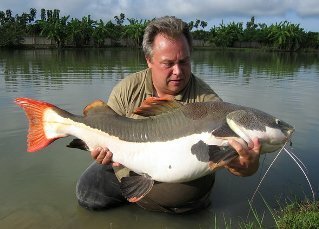 Add to that the fast-growing hard-fighting species – the cream of carp and exotic catfish species running to weights of well over 100 pounds/ 40 kilos, plus the prospect of the mighty Arapaima, which can run over 200 pounds / 80 kilos. The experienced guides are flexible on the various approaches to closing in on the specimens – I learnt a lot of new techniques as well as catching new species: carp, red-tails, Featherback and many more. Two key points struck me as unique to this venue: the superb home cooking of Noon, so superior to what most Thai restaurants can provide; and the feeling of peace and seclusion, on a walled estate in a tranquil corner of the Thai countryside.Yet if a break is desired from the fishing, there is so much to see and do in the Chiang Mai area, one of Thailand’s cultural heartlands. Yes, I will be back! "My son and I have had the pleasure of fishing at Teak Tree Lake on 6 occasions during the past 2 years. In this time I have watched the gardens and vegetation mature and more importantly, the fish have thrived, growing to impressive sizes. We have always been made welcome by the Teak Tree Lake Team who have gone out their way to ensure our stays were enjoyable. The accommodation is first class and the home cooked meals extremely tasty. We have really enjoyed having the exclusive use of the lake and the experienced guiding teams knowledge of the fish species and the lake has been shared freely. This has certainly helped us catch numerous large fish including Arapaima to 70 kg, Siamese carp to 20 kg and Red- tail catfish to 29 kg. We have also caught at least a dozen other species which have often been at very good sizes for their species. 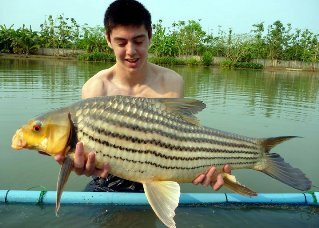 I would definitely recommend Teak Tree Lake to anyone wanting an exclusive fishing holiday targeting a variety of large Thai and imported fish.